Do you have crafts and hobbies for stress relief that don’t require leaving the house, such as knitting, crocheting, coloring books for adults, or cross stitch? Or maybe you do leave the house — to nerd out with other people about knitting needles or a certain brand of yarn or different colors of floss you use for cross stitch. In addition to providing a creative outlet and stress relief, many crafts and hobbies are fairly easy to learn (hello, YouTube), and you may even have a friend who’s been posting her (or his) work on Instagram who can give you advice. Crafting can be relatively inexpensive and can even save money (homemade holiday gifts, anyone? ), and it pairs well with a glass of wine or a Netflix binge — just don’t accidentally spill anything on your creations. While I’ve tried to learn knitting as a form of stress relief, and I used to be fairly adept at crochet when I was a kid (including an unfortunate belt that I thought would start a new trend in middle school … but didn’t), I just couldn’t get into making scarves and hats. However, I do love the accessories my friends can make, and I have greatly appreciated the work that went into every homemade knitted item I’ve received as a gift. Maybe someday I’ll give it another shot. For me, the crafting hobby of choice came about after noticing a few friends’ cross stitch masterpieces on Facebook. Those designs started me down the rabbit hole of various non-traditional patterns, including a few that incorporate pop culture references to everything from heavy metal to Keyboard Cat to the Wu-Tang Clan. (If you were wondering, according to the Wu-Tang Clan name generator, my name is Zexy Bandit). I even bought a couple kits from a handmade goods store, but I never made the time to do them. 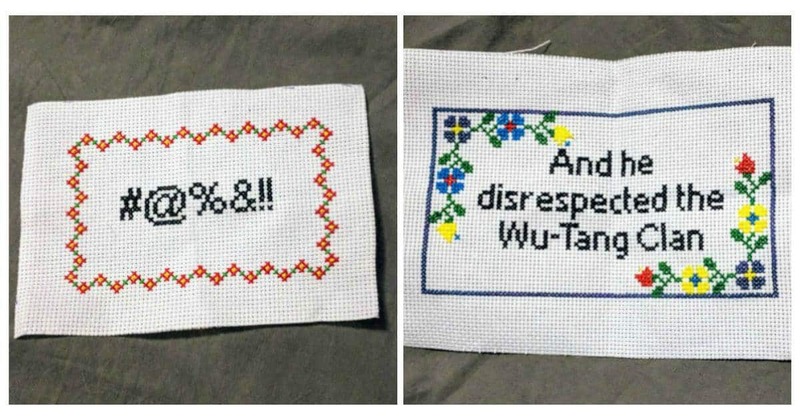 Last summer, a friend hosted a group of women to teach us about cross stitch in a fun, low-stress environment, and as something to do when we were feeling stabby. She provided the kits — patterns, floss (thread), aida (fabric), and needles, as well as instructions and words of encouragement. She also showed off some of the more complicated designs she had done (along with some other patterns for inspiration) and shared the history of cross stitch. A few of us have met a few times at a coffee shop to continue our crafting. Since that night, I’ve finished three patterns — including two that I bought on Etsy (this one and this one). Plus, I recently received a copy of Subversive Cross Stitch by Julie Jackson. While not new to the crafting scene — Jackson brought cross stitching to a new level with the first edition of her book in 2006 — it is something I’ve been wanting to check out for a long time. I recently discovered, and promptly bought, her updated 2016 edition, making me one of the countless crafters she has inspired to make what amount to memes made of floss and fabric. Who wouldn’t want a framed “BITE ME” surrounded by ornate snowflakes and squiggly lines? Jackson’s book and website also include different fonts, a blank grid, and several different borders that lend themselves to just about any movie phrase, song lyric, inside joke, headline — you get the idea. She regularly updates her site to include new patterns, including “Nevertheless She Persisted” and “Reclaiming My Time,” plus clever cuff patterns and holiday themes. Between Jackson’s patterns and numerous other options for kits and patterns available on Etsy, even if you prefer the more traditional patterns, the possibilities are endless. So let us know, readers: Is there a craft or hobby that you do as a form of stress relief? If you cross stitch, do you prefer 11-count or 14-count aida? Do you have several go-to gauge sizes for crochet hooks? When it comes to knitting, do you know the difference between a skein and a ball of yarn? Is there a pattern you’ve been dying to try, a project you haven’t quite finished yet, or a crafting blog you’d recommend? I’d really like to take up embroidery. Does anyone here do that? I do crosss-stitch, but large, complicated projects (my favourite kits are from Dimensions). They require a lot of time, so it takes me ages to finish the project. Kat’s projects are simplier, more suitable for beginners and waaay faster. I think that it’s very easy to pick up cross stitching from online tutorials. I’ve learnt as a child from my grandmother and illustrated tutorials printed in a magazine. I’ve taken up embroidery this year! I wanted a hobby I could do without having to get off the couch and it’s really calming to embroider a little in the evening. I got a cross stitch kit at the same time to try – there seems to be more cross stitch ready-made kits out there than embroidery – but I didn’t take to the map things which feel more technical than I want with a hobby. I like that embroidery has lots of different stitches that give different effects. I’ve bought full kits from the Etsy shops fileusedetoiles, OhSewBootiful, TheMakeArcade, and HawthornHandmade and follow the instagram tags hoopart, contemporaryembroidery, modernembroidery for inspiration. Counted cross stitch is a pain. The best is to find one where the pattern is already printed on the canvas. I do crewel. There are quite a few different stitches, so it’s more involved than cross-stitch. I knit but I’m hot and cold with it. I have been knitting since I was a young girl so I was into it before it became “cool” a decade+ ago, but the trend was actually really helpful because nicer fibers became available. Over the course of my life I’ve knit a lot of sweaters, many for me and just as many for the people I love. Baby sweaters are particularly fun. At this point I don’t use a pattern. My teenaged son likes a basic striped raglan pullover in a cotton yarn. My teen daughter likes a cropped but slouchy style cardigan in thick and thin cotton. My husband has so many hand knits from me that he will never need another. I even knit him a very plain stockinette pullover using laceweight baby alpaca on size theee needles (death by stockinette) which took forever but it is gorgeous. The project that is driving me nuts right now is finishing a knitalong Afghan that I started last winter. It was put out by cascade. They issued a square every two weeks or so. I have knit 25 out of 30 and I’m just not that interested in the remaining 5, so I could put it together in a square now, but honestly putting it together also sounds like a pain. I have finishitis. I do embroidery. I took an intro class at my local craft store to learn the various stitches. If you don’t want to create your own patterns just yet, I highly recommend Studio MME’s patterns. She has a lot of fun ones to choose from and you can even get the packs with preprinted fabric and the thread so all you need are an embroidery hoop, a needle, and scissors. Good luck! And this was mean for Anonymous 1:39 above. For those of a progressive bent, a great craftivism project is Postcards to Voters. We send handwritten, positive postcards to voters to get out the vote for Democratic candidates. And if you aren’t crafty (like me), you can use any neutral pre-printed postcard. All you need is enthusiasm and readable handwriting! I make scrapbooks of big vacations (currently working on one of our trip to Thailand last year! )- it’s nice to get all the pictures in one place, and I find it to be a good way to decompress. This sounds really fun. I could see myself getting into it, but then what are you supposed to do with each piece when you’re done? They might work for one or two birthday gifts, but after that ….? 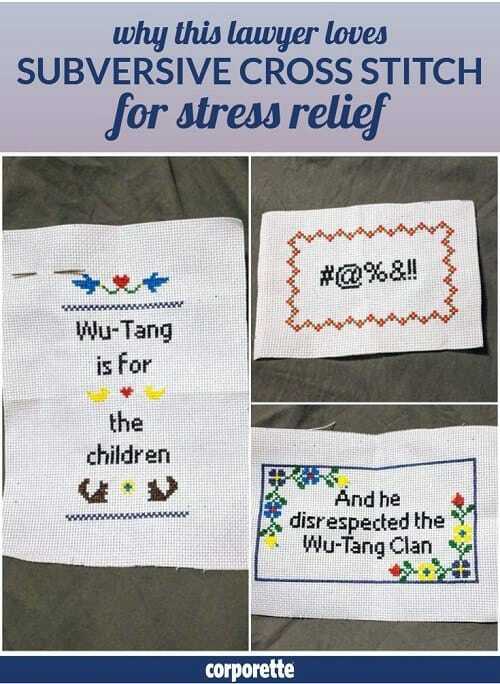 This is why I stopped cross stitching. I couldn’t figure out what to do with the pieces once I was done and they didn’t seem like stuff I could give as gifts. I do needlepoint, which is similar to cross-stitch. I normally have two projects: a “thinking” project and a “mindless” project. Thinking projects are for when I want a non-work-related challenge, similar to doing a 1000-piece puzzle. Mindless projects are for the bus (though be careful not to poke out your neighbors’s eye with your needle) or watching TV. It’s fun, and always sparks conversation from people around me! I do needlepoint as well! It’s so relaxing to have something to do with your hands. When it’s complicated, it’s perfect for a sunny weekend afternoon listening to podcasts or music, and the simpler ones are good for watching TV. I made a nice one of a lighthouse for my brother’s wedding, and embroidered their initials and wedding date in the corner–but it took so long that I had started it before they even got engaged (I figured it was inevitable), and still had to stay up until 4 in the morning to get it framed in time for the wedding. I think that one was like 16 months. When I go to London, it’s a real treat to go to Liberty of London and pick out a new kit. I crochet. I’ve recently switched from blankets to stuffed animals, which are much smaller/faster and make great baby gifts. Aside from the baby-gifting aspect, I have also run into the “what to do with all these crocheted things” problem. I’m contemplating trying to make blankets to donate to local hospitals and/or shelters. I’ve seen various organizations online that accept that type of donations, but haven’t tried it out yet. Does anybody do monogramming? I guess that would fall under embroidery. I would love to learn but trying to understand how complicated and expensive that would get. I’d like to monogram clothes, pillows, etc. 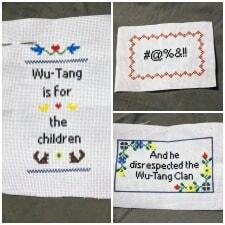 Thanks for featuring our Wu-Tang stitch! We are both lawyers as well and teamed up to create the basic stitches. What started as stress relief turned into an Etsy shop. Have fun stitching!